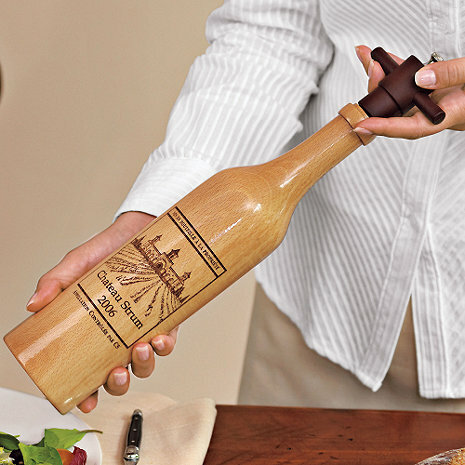 Our wine country salt mill can be personalized and is a great accent to your dining experience. Laser engrave any name (up to 14 characters including spaces) for a custom touch. The salt mill uses a cutlery grade high impact plastic mechanism, so not to arode from salt, which adjusts to reduce 3/4 cup of sea salt to a very fine grain. Handsomely crafted from maple wood, with burgundy top. Once ordered, personalized products are non refundable unless there was an error in production. I bought this as a gift and was very impressed by the quality and craftsmanship. The personalization also added much to its charm and is an attractive addition to any tabletop or counter. This is a great gift item! This is a gift item, and because of the personalization I will remember the person who gave it to me everytime I use it. I am happy to tell people where I got this product. Thank goodness she loved it! I have the pepper mill and love that - that's why I orderd one for my niece.I thought I had ordered the pepper mill for a shower gift but saw it was the salt mill when it was opened. Great wedding gift. We have given several and always get big thanks!